Announcement I will be out of town from February 2 - February 8. I will leave my shop open and I can answer questions, but I cannot ship anything during that time. You are welcome to convo me with any questions. Welcome to BelleJouJou! The name means: "Beautiful Little Somethings" in French. 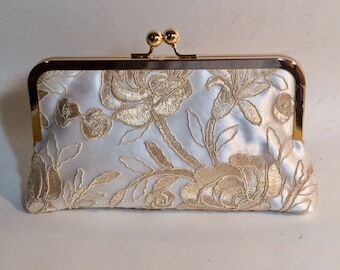 I make custom bridal and bridesmaid clutch bags as well as evening and daytime clutch bags. Everything is made in a smoke-free home. BRIDAL PACKAGE. Please convo me for discounts on multiple orders. Orders over 3 or more may have a 10-15% discount. CUSTOM ORDERS: The silk clutches can be made in your colors for your special day. You can also change the fabric for your clutch. Please feel free to convo me with any special requests! All of my products are handmade using silk dupioni fabric. Dupioni silk is a handmade (not machined) shimmery gorgeous fabric made by weaving two different colors of silk threads together which gives it a distinctive stubbled texture. Please note that since two different colors of silk thread are woven together, color variations can occur and the silk may cast different colors in different lights. If you desire 100% exact matches to your event color, please order a sample (contact me for more info) or feel free to send me a swatch. More info can be found in my shop policies. CUSTOM DESIGNS: Do you have an idea you want to see made? I can do YOUR custom design - limited only by your imagination! Designer styles at a fraction of retail. I can use your fabric, lace or even jewelry and design a special bag that's your design! Just let me know what you want to do. I will be out of town from February 2 - February 8. I will leave my shop open and I can answer questions, but I cannot ship anything during that time. You are welcome to convo me with any questions. Such a gorgeous and unique clutch. So happy with my purchase from BelleJouJou. I would highly recommend purchasing from Cynthia! Chain Add on for Clutch 24"
Cynthia is amazing! Just beautiful work. My mom will probably cry when I give her this for my wedding. Such a unique and meaningful gift. Turn around was incredibly fast. I was worried about ordering it a month prior to my wedding, but Cynthia said it wouldn't be any trouble at all. Thank you so very much! Had this made from my Mother’s dress. Can’t wait to give it to my daughter at her shower. It’s perfect and just what I hoped for. Welcome to BelleJouJou! I hope you enjoy browsing my collection of beautiful, quality and custom clutchbags. Some of my items are one of a kind, and all are in limited quantity. I'm adding new items all the time, so be sure to check back often. ALL SALES ARE FINAL. Each order is handmade myself, therefore returns/canceled transactions are not accepted. **Purchasing an item infers that you have read and accepted all shop policies and shipping warnings. Should there be a problem with your purchase, the buyer must contact seller within 3 days of receipt of goods. An exchange may be granted on a case by case basis at the sole discretion of BelleJouJou. Items must be returned within 5 days in the original packaging and condition per seller's instructions. Seller will issue exchange once it deems items have no evidence of wear and tear. The buyer is responsible for all additional shipping charges. Shipping charges are not refundable. Returns are not granted for color matching or if actual colors appear different than on computer monitors. If concerned with color matching, you are advised to request swatches prior to the sale. I can also attempt to verbally describe a shade through email prior to the sale. If a problem occurs with your order, please contact me prior to leaving feedback so we can try to resolve the situation. If you change the colors or any custom information with a custom order, it must be done within the first day of ordering. After 24 hours, I will have to charge $15 for any changes made to your custom order. *Not responsible for lost or stolen items once shipped. Refunds and/or replacements are not granted for lost/stolen items nor if a customer submits an incorrect mailing address. Provided that the item is eligible for return and has not been used or damaged, you may exchange or return it within 14 days of receiving your purchase. Only items returned in their original condition will be accepted. Once we have received the item and verified that the above conditions are met, we will promptly process the refund/exchange. PLEASE NOTE: Return shipping cost is at the expense of the customer. CUSTOM ORDERS: I cannot accept returns or refunds on custom orders. NO REFUNDS OR RETURNS ON SALE ITEMS. ALL SALES FINAL. If any of the items from your order are missing, broken, or damaged when your package arrives, please contact us with your name, Transaction ID and a description of the problem. We will do everything we can so that you are satisfied with our product! I accept payment through PayPal only. All prices and quotes are in USD. You don't have a PayPal account? No problem! You may still make a payment with your credit card through PayPal even without an account. Payment is expected at checkout. Unpaid items after 3 days will be relisted. I ship USPS First class mail, world wide. Items will be shipped next business day, if they are in stock, and generally take between one and three weeks to arrive, depending on your location. Of course, estimated delivery times are not guaranteed - international packages especially may be subject to delays. If you need it faster, it can be shipped priority mail, which should arrive in 2 days time. Please convo me with your request. I will ship large orders over $100 with insurance and the shipping will be added to cover this cost. I ship with a flat package rate. If you need your item faster, please let me know. Expedited shipping can also be arranged if needed, please contact me for a quote before purchasing. The buyer will be responsible for any customs fees/duties incurred. I can ship internationally. Your item will be shipped "First Class". This was the least expensive method I could find for international shipping. I will email you once the item ships with the USPS customs' number. It cannot be tracked by anyone other that the USPS. It can only be tracked by the USPS to the point of departure from the US. It may help you locating the package at your own customs office. International customers are responsible for all customs and import taxes required by their country. PLEASE NOTE! For International Orders: Your package may take up to 21 "business" days or more to reach you. Your shipping time is dependent on your country's customs policies and your postal service. Again - you are responsible for any customs tariffs or taxes. Custom orders are welcome! Turnaround time is presently 1-2 weeks, depending on how large the order is. Payment is required before work can begin. Regarding reserved items: an item may be placed on reserve for a period of three days. If the item is not purchased within three days, it will be taken off reserved status and made avaliable for sale to the public. Please contact me via Etsy conversations for information about custom orders, wholesale and consignment arrangements. Thank you, and happy shopping! !